This is fancy. I’ve never seen anything fancy like this. Ah-ha, look at that! It’s shaped like knife. Basket makers peel birch bark in the spring or early summer, taking only the outer layer so that the tree will survive. 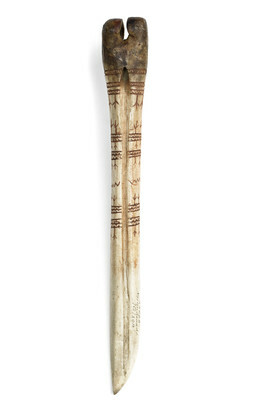 This traditional Koyukon tool for loosening and stripping the bark is a sharpened caribou leg bone, decorated with raven-foot designs; today people use a wooden stick for the job. To make a basket, the artist cuts the stripped bark, applies heat to make it flexible, folds it into shape, and stitches it with spruce or willow root. Eliza Jones: What kind of bone is it? Judy Woods: But you have to take it off carefully. . . .
Eliza Jones: This is fancy. I’ve never seen anything fancy like this. Ah-ha, look at that. It’s shaped like knife. Aron Crowell: Is that a caribou leg bone? Eliza Jones: It doesn’t look like caribou. I don’t know what it is. Judy Woods: Maybe small moose. I don’t know. Trimble Gilbert: I don’t think so. . . . I don’t know what it is. Eliza Jones: Maybe it’s sea mammal. . . .
Judy Woods: Sure is fancy. That might look like seal. Eliza Jones: And the design doesn’t look like our area. . . . It might be a sea mammal, because it doesn’t look like a caribou. It doesn’t look like any animal around our area. Judy Woods: Yes, caribou are different. They have bigger joints. Eliza Jones: Yes, it’s kind of shaped like—the blade is like that. Yes, you can use it that way. Aron Crowell: Was it smaller than that? Eliza Jones: It’s flatter. It could even be made of wood.
. . . Well, maybe they used it for—yes, bark stripping might have been one use. And it probably had multiple uses.